‘They have every right to express their First Amendment rights outside the stadium,’ he said. 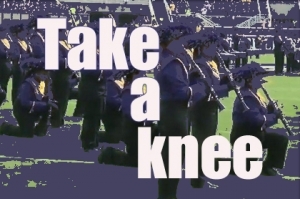 McCrory suggested that the band members were running afoul of the rules when they made a statement on the football field in solidarity with demonstrations nationally against police shootings of African-Americans. “So, the first amendment does not apply in football stadiums? What about the fan who sits behind home plate at most Washington Nationals baseball games wearing a ‘Make America Great Again’ hat? What about appearances by politicians during halftimes? Or first pitches tossed by presidents and governors? What about the fans who boo when presidents and governors toss out first pitches? The band members’ protest was silent and dignified and disrupted nothing. Nobody walked away from a performance and carried a sign. Strangely enough, the governor made no comment about the reaction of some ECU fans, who booed and threw bottles and yelled racial slurs at the band. That seems more un-American to me.